SHAWNEE—Oklahoma Baptist University (OBU) hosted a basketball tournament, March 5, featuring teams representing Baptist Collegiate Ministries (BCM) from 22 state schools. East Central University (ECU) in Ada collected both the men’s and women’s tournament titles, as there were 22 men’s teams and 10 women’s teams competing. Members of the ECU women’s team included Emma Branton, Brook Hurst, Sadie Marino, Tia Mitchell and Shelby O’Dell. Members of the ECU men’s team were Caleb Hardage, Josh Hardage, Brent Hill, Dylan Jones, Garrett Langley, Bryce Newton, Dalton Shumate and Brady Sorrels. Other schools represented at the sporting event included Bacone College, Cameron University, Carl Albert State College, University of Central Oklahoma, Eastern Oklahoma State College, Murray State College, Northeastern State University, OBU, Oklahoma City University, University of Oklahoma, Oklahoma State University (OSU), OSU-Oklahoma City/Redlands Community College, Southeastern Oklahoma State University, Tulsa Community College (TCC) Northeast, TCC Southeast, TCC West, University of Tulsa, University of Science and Arts in Oklahoma and Western Oklahoma State College. “This was a great turnout with 22 different schools represented,” said Cris Lowery, BGCO specialist for Baptist Collegiate Ministries and emerging generations. “One way for BCM to be effective is to create events and opportunities for students to come together and build relationships. Sports, even on the recreational level, helps this cause. This tournament is a ‘front door’ to students who get involved initially because of the opportunity to compete. 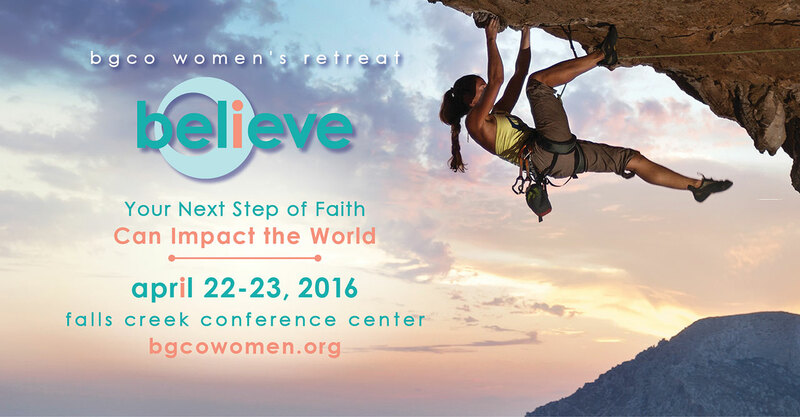 2016 BGCO Women’s Retreat Hear Kelly King talk about the upcoming retreat at Falls Creek in April.